There are many different products available to help you with your wound care. We carry a great variety by a several different manufacturers. In many cases you might find a couple of different options for a same/similar product as multiple manufacturers may make the same item, an example would be Kerlix roll gauze and Sterilux fluff roll gauze. These two items are almost identical to one another, they just come from different manufacturers. Check with your health care provider to see what they suggest as your wound care plan. Here is a guide to wound care dressings. Calcium Alginate Dressings are absorbent wound care products that contain sodium and calcium fibers derived from seaweed. These dressings, which are easy to use, mold themselves to the shape of the wound, which helps ensure that they absorb wound drainage properly. Use on pressure ulcers, diabetic ulcers, leg ulcers, donor sites, surgical wounds, lacerations and abrasions. Gauze Pads Sterile and Non-sterile are used in wound care. Sterile gauze pads are packaged in small quantities to help keep them sterile, sterile gauze is used for many medical purposes, especially on open wounds. Non-sterile gauze pads are most often packaged in bulk, not individually wrapped and may be used for cushioning, cleaning, and absorbing areas less at risk of infection. Gauze pads come in different “ply”s (8 ply, 12 ply) this is the thickness or layers of the folded gauze. Gauze Rolls are rolls of gauze in sterile, non-sterile, stretch and non-stretch types. Used as part of a total wound dressing system. Most often used to help secure the primary dressings in place and or to add some compression. Hydrocolloid Dressings such as DuoDerm, DynaDerm, DermaRite, DermaFilm, & ExuDerm are some of the hydrocolloid dressings designed to maintain a moist wound environment that remains permeable to moisture vapor and oxygen. Can be safely worn for several days, depending on the wound condition and exudate levels. Uses: Non-infected wounds, partial thickness ulcers, full-thickness ulcers. Hydrogel and Hydrogel based Dressings - The benefits of using hydrogel-based dressings for wound care are vast. An excellent source for providing moisture to a dry lesion, hydrogel dressings act fast to help cool down a wound, as well as provide temporary relief from pain for up to six hours. Hydrogel dressings can be used for lightly exuding or granulating wounds but are not generally suitable for already infected or heavily exuding wounds. Non-Adherent Dressings typically use no adhesives and the wound contact layer will not stick to the wound itself. They are available impregnated or nonimpregnated and discourage foreign matter from becoming lodged in the wound bed. They can be used on skin tears, donor site and skin grafts. Most non-adherent dressings require a cover bandage or tape to hold them in place. Oil Emulsion Dressings are sterile, knitted gauze impregnated with an oil emulsion blend. Non-adherent to the wound site. Maintains moist wound environment. Non-occlusive primary dressing, allowing the flow of exudate away from wound site into a secondary dressing. Used on donor sites, graft sites and draining wounds. Packing Strips can be plain or be impregnated with iodoform solution. Used for nasal passages, drainage wicks or packing deep wounds to manage infection. Petroleum Gauze Dressings are sterile non-adherent primary dressings that maintain a moist wound bed for healing. Cotton gauze impregnated with petroleum for a smooth and conforming dressing. Used for non-draining wounds such as tube sites, skin grafts, circumcisions, burns, non-infected wounds, pressure ulcers and abrasions. Self Adherent Dressings or Wrap is an elastic wrap that functions as a tape, but only sticks to itself, not the skin. 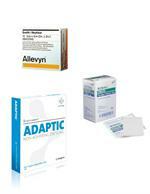 Used for basic wound dressing and compression dressings. Often referred to as Coban wrap. Steri-Strip Adhesive Skin Closures are used in the closure of lacerations, surgical incisions and following early suture/staple removal. Tubular Elastic Bandages are used for pressure dressings and also provide support for sprains, weak joints or general edema. Stays in place without pins, clips or tape. A convenient alternative to flat wrap bandages, Easy to apply, not bukly. Allows freedom of movement and comfort. Tubigrip or SpandaGrip are the names of a few. Xeroform Petroleum Dressings are made of sterile, fine mesh gauze impregnated with a blend of Xeroform and Petroleum. Medicated to prevent infection of wound site. Non-adherent to the wound site. Xeroform maintains a moist wound environment. It is a Non-occlusive primary dressing, allowing the flow of exudate away from the wound site into a secondary dressing. Indicated for use on minimally draining wounds, including surgical incisions, laceration, donor sites and burns.